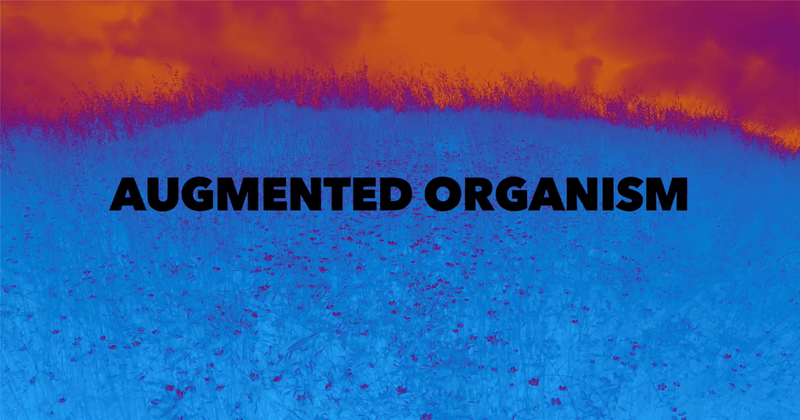 In their film Augmented Organism, Jazmyne M. K. Geis and Cy Gorman not only explore, but master many of those possibilities. As an art form, dance on film is in its very early stages. Despite the visual enchantment of concert dance, there isn’t yet any widespread understanding of how that enchantment can be shared with a wider audience in video and film. In some important ways, concert dance’s presentation on film in 2018 is like music’s presentation in recordings in 1918. When it first became possible to record music and replay its performance to a far-flung audience, almost everyone thought of that process as simple replication. The idea was that whatever was done in performance, that was what should be on the recording. It took half a century for artists, producers and audiences to discover how much more there could be than just that. Gradually, the people recording music — and those enjoying those recordings — discovered that production was different from performance. The first thing they discovered is that much is missing from a recording, no matter how skillful, compared to the moment when you are really present, experiencing all of the sights and sounds and feelings of live performance. The second thing people began to discover, though, was that there is much that is possible in music production that is not possible in a moment of performance, and that some of those techniques can bring a completely new enchantment and inspiration to the experience of sharing music. There are probably many skills, many ideas, and many techniques yet to be discovered that will bring that same new dimension to concert dance when it is presented in a visual recording. In their film Augmented Organism, Jazmyne M. K. Geis and Cy Gorman not only explore, but master many of those possibilities. The original inspiration for the film was an awareness shared by Geis, from Hawai’i, and Gorman, from Australia, of the immense importance that place can have on personal development. But this became an even more complex, and more rich exploration when the two met in the extraordinary setting of Finland during the months of the midnight sun. Augmented Organism, as you’ll read in the insights Jazmyne M. K. Geis shares with us here, explores many themes, with Geis’ choreography and dance performance woven into an extravagantly effective visual experience designed by Gorman. Geis told us that neither of them consider this a solo performance, though. As they made this film, they both thought of it as a performance by two dancers, because they considered the camera to be a second dancer, and throughout the film, the movement and motivation of each shot is as choreographed as the dance performance by Geis. Geis and Gorman bring a full understanding from concert dance of the crucial impact that the arts of design — lighting, costume and sound design — have in dance. The lighting design, most of it captured in nature but nevertheless brilliant in the design of its presentation, the costume design, and Gorman’s excellent score design and original compositions all beautifully support the narrative and the experience of Augmented Organism. If you would like to see the film, or to experience some of the chapters, before reading what Jazmyne M. K. Geis shares with us in these 4PHOTOS, you can watch a trailer from the film at Augmented Organism / Feature Film. The entire film is also available to view at no charge at the same link if you would like to register with your email and name. This image is a capture from the chapter Sky Dance shot in the countryside of Finland on top of a landscape sculpture called “Up and Under” by artist Nancy Holt (USA). The Finnish summer sky was an ever-present backdrop during our time there, with a purity of blue that took our breath away. This with the dynamic movement of white clouds led us to the core element of air, which influenced the movement quality of the character in Sky Dance, and showed us a story of an ethereal journey from sky to earth; well deserving of an entire film chapter. Sky as a theme emerged from day one when we arrived in Finland. The sun’s rays and long summer days of light highlighted the heavens, pushing out the existence of darkness and the brightness of the stars. A mirror of the sea — the calmness of morning clouds, fluffy and white, morphed to streaks of twisting channels and spirals as the winds picked up, weather changed, and the day came to a close. It is a journey of discovery not for the faint hearted. Streaks of pink and purple, along with orange in rows of color and flavor, painted the sky and the trees below as the sun disappeared to the north. This sky was a shape shifter — the dance of dense moist masses, drawn out into lines, created patterns and strokes much mimicking the painter’s hand. This was the Maiden’s path, separating from the sky and destined to experience all the facets of herself. This acts as a mirror for the viewer to walk in front of, to ask if this story is not one we know well. This image is a capture from Dark Lady shot from within the landscape sculpture called “Up and Under” by artist Nancy Holt (USA). This is quite the contrast of environment compared to Photo 1. This setting gave space for the story to ground Sky Dance deep into the underworld, away from the sky’s light. The play of shadow and light in this image captures the themes of this chapter — revealing and concealing. What does the darkness bring to light and reveal? What does the light do to conceal what is lurking within these tunnels? This chapter of the story is a transition about confrontation with the truths we’d so wish to ignore. Who said that growth would be easy? She is the destroyer of illusions, empowering to move forward, although if led down the wrong path, a shadow self could use such power to feed its own agendas. Once this challenge is taken, there is no going back. The midnight sun’s shadow is unveiled, and darkness makes its presence known. The Dark Lady involves a necessary maturation phase of the Maiden, having seen all levels of reality from the underworld and beyond. Dark Lady represents the shadow self, the pit of darkness where new seeds start to grow. It is not a negative place, but rather a vault within the spacetime that invites those who seek deeper understanding of their path in the world, to get intimate with themselves through experiencing different versions and mirrors of self. This chapter really brings the viewer out of the mythological “otherworld” feel of the past two chapters and grounds us back into the basement of reality and the beats of familiarity. It is the one chapter in this film that feels “human” and of this realm. This acts as a mirror for the viewer to walk in front of, to ask if this story is not one we know well. The lake, the clouds of mist, and the sky converged into a birthplace where heaven and earth met. This image is a capture from Misty Mirror shot in the Finnish countryside (Hämeenkyrö, Finland). Lakes are the reflection ponds of the north, mirroring the sky in all its color and glory. They were everywhere in our direct environment, so it felt necessary to include the element of water into the story. We watched this lake for days, seeing how the colors changed during the day and how the temperature from evening to morning brought about a mist that hovered over the lake, creating this image of relationship between sky and earth. This theme brought the project to its opening chapter where the character emerges from this spacetime and is birthed into creation. As the heat of the day settled into the coolness of the evening and then –after what seemed like only moments later–crossed over into the Finnish morning, a hovering mist formed over a mysterious lake. The Misty Mirror emerged from the depths of a translucent blue darkness in the silence of the colorful early dawn. This place of still and quiet reflection created a magical shroud within which the first chapter of Augmented Organism began. The lake, the clouds of mist, and the sky converged into a birthplace where heaven and earth met. This chapter’s imagery and storytelling ended up holding so much cultural reverence — in its multiple references to creation myths from world wisdom traditions — that it really set up the narration of the beginning of the work. The birthing of the Maiden– who is the first archetype in the story—references the origins of the universe. Emerging from the spacetime before existence, where sky and earth were one, an organism emerges from the murky depths of darkness and slime, realizing its separation into “I”, an entity removing from its source. This chapter exemplifies how the AUGORG project explored the theme of identity as environment/ environment as identity, looking at ways locality and environment influence and shape the identity of species — maybe even as much as parental and socio-cultural directives do. Environment is the super-system and network in which we all coexist and adapt to. It defines the boundaries of the physical world. In this chapter, the environment is shifting and is being redefined through the perspective of the character, as it starts to explore and form its identity of “I”, separated from its place of birth. This image comes from the chapter of the work called Necrosis. This image highlights the activation and dynamic strength of the character’s movement in this chapter. The mood and environment have a contrast of lifeless brown decay and green standing forests. The setting of Necrosis was taken on a large brown deforested plot located in the countryside of Finland, which was obviously stark in appearance in comparison to the miles and miles of green wooded forests. The Necrosis chapter was uprooted from the lands of the dead. Holes of brown unearthed patches from an improper harvest. A low laying disease that contrasted the deep green thickets of healthy Finnish forests. Wood stalks lined up in rows, branded with markings of grade and price, as their roots lay in piles of waste beside the road. It was a feeling of darkness that contrasted the purity of the natural landscape. It was the scars of battle wounds. This is a time of unearthing the hidden ugliness, the demons in the closet, confronting the frustration, anger and sadness and moving on. A journey back to the start of existence, acknowledging the past for its fall from grace, its wisdom, and its lessons, choosing to ground one’s forward journey in the deep pool of acceptance. It is also the maturation of the psyche and the acknowledgement that death and destruction have its place when in harmony with the seasons. Further mythological inspirations that supported the story of Necrosis was the archetype of the Lady of the Harvest, representing a death and a rebirth, the natural cycles, and a release of the past to make room for the now. Connecting with this inner warrior allows the chips of anger and sadness to release, allowing the things that no longer serve us to burn in the cleansing fires of change. This is the climatic chapter that has remnants of its spirit emerging in our current world. We are navigating the necrosis effect and changes in many areas of the environmental, social and political landscapes of today, and our challenge lies in how we come to terms with accepting what is and adapting to the change that is being asked of us from the true nature of ourselves. AUGORG is a project that asks us to remember our source, to remember our true nature, and to remember our innate relationship and identity with the environmental landscape. This is a familiar journey that we are all on individually and collectively as we grow, adapt, conform, rebel, deviate, and return again.